Experience shapes the brain and it is the school’s goal to provide opportunities for academic engagement that inspire students to think independently, as well as empowering them to apply information and be problem solvers. The Lower School recognizes students as individuals with specific strengths and needs and views learning as taking place on a continuum. Children’s capabilities, interests, and current knowledge are foundations from which to begin inquiry. Lower School endeavors to create and maintain a community that supports learners’ curiosity, creativity, excitement and ownership of the process and strives to develop student’s lifelong pursuit of knowledge. The curriculum is chosen and designed to engage learners, build self-confidence, and promote good habits of citizenship. Know that it is okay to make mistakes and that mistakes are an important part of the learning process. First grade learners spend the majority of their school day with their homeroom teacher. They receive instruction in language arts, math, social studies and science in that setting. Second and third grade students receive instruction in language arts and math in their homeroom setting and receive instruction in social studies and science from a grade level teacher who concentrates in either social studies or science. 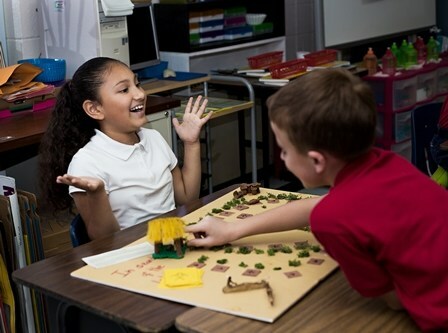 Fourth and fifth grade students receive instruction in language arts in their homeroom setting and receive instruction in math, social studies and science from a grade level teacher who concentrates in either math, social studies or science. Specialists in first through fifth grade teach art, Christian Education, music, technology, library, Spanish and physical education. Because students need strong bodies to fuel strong minds, all Lower School learners have a daily recess period in addition to a daily physical education class. Research shows that play is linked to foundational skills and complex cognitive activities such as memory, self-regulation, oral language abilities, successful school adjustment and better social skills. St. Clement's School is accredited by the Independent Schools Association of the Southwest (ISAS) and the Texas Education Agency through the Texas Private School Accrediting Commission (TEPSAC).